Screamer Radio is an Internet radio player ready with hundreds of easily recordable radio stations at your fingertips. Based on the bass audio library and designed not to be in your way, Screamer Radio will not slow down your computer and can be easily hidden in the system tray.Recording Features: Recording buffer: start recording in the middle and still save the entire song! Direct MP3 Audio, OGG Vorbis stream saving, no loss of quality! *Recording buffer: start recording in the middle and still save the entire song! 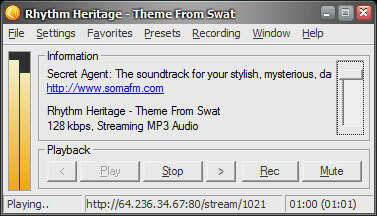 *Direct MP3 Audio stream saving, no loss of quality! *Direct OGG Vorbis stream saving, no loss of quality! Qweas is providing links to Screamer Radio 0.4.4 as a courtesy, and makes no representations regarding Screamer Radio or any other applications or any information related thereto. Any questions, complaints or claims regarding this application Screamer Radio 0.4.4 must be directed to the appropriate software vendor. You may click the publisher link of Screamer Radio on the top of this page to get more details about the vendor.